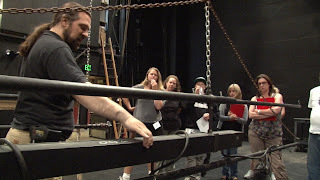 Earlier this month, Seattle Opera’s Education Department partnered with the Western Washington Theatrical Training Trust for a very special technical theater workshop. The workshop, hosted at Seattle Repertory Theater from August 2-4, was geared toward teaching high school students and teachers skills they could go on to use in their own productions. Education Intern Olivia Biddle was there, and she shares the following recap of this exciting event. 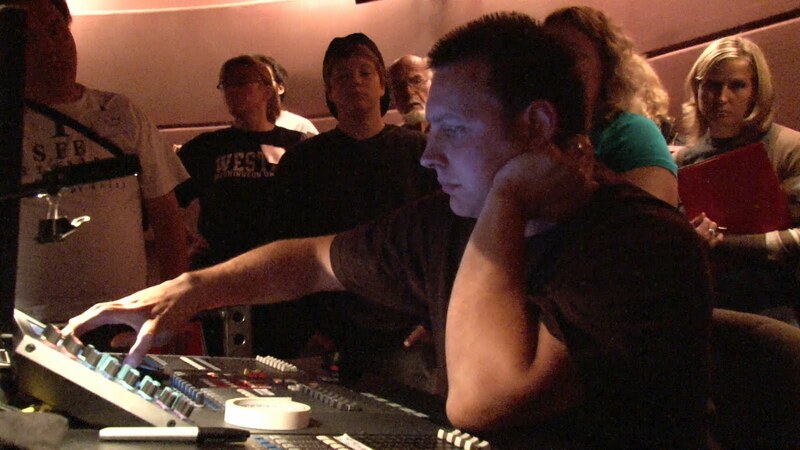 On the first day of the workshop, participants checked out some of the newest technology in stagecraft, while learning how to use the equipment they’d find back in their own high school scene shops. Our pros shared inexpensive tricks of the trade that can be used for set building, and cut a set piece that the participants then took to the paint shop, where they learned practical tips to use back at their schools. Next, the group got onstage and learned about safety when using the fly system—literally “learning the ropes” with the rail (technology as old as sailing, which helps quickly and easily fly set pieces, lights, and curtains in and out). The next day, the group learned to use lighting equipment: the basics of how electrics work, how to hang a light, and how to mix colors to get desired effects. Lighting offers a special kind of theatrical magic, but the use of projection is also becoming much more common and offering a magic all its own. We explored how projections enhanced the production of Sunday in the Park with George at the 5th Avenue Theatre in 2009; the set images were all projected rather than painted. High schools, of course, are not as well-equipped as a professional theater the size of the 5th Avenue Theatre or Seattle Repertory, but the group learned how to creatively use what they have on hand, such as using mirrors and angles to fill a tight set piece with projections. On the final day of the workshop, participants learned how to manage a one-minute quick-change, turn a high school student into Grandfather Abernathy, and make the Wizard of Oz sound bigger than life. They also got tips on organizing their costume stock, different techniques for applying make-up, and yet more techniques for getting makeup stains out of costumes. The group also learned how to use a variety of different sounds, set frequencies, and keep a mic pack from shorting out when it is strapped to an actor. Seattle Opera is excited to partner with other local organizations to offer programs that help local schools, the community, and individuals--and it is exciting to know that through programs such as this one, the next wave of great theater crew is being trained today!